The stations are built largely with 3D-printed parts that can be easily replaced if they wear out in the field. They were created by weather experts at the National Center for Atmospheric Research (NCAR) and its managing entity, the University Corporation for Atmospheric Research (UCAR). 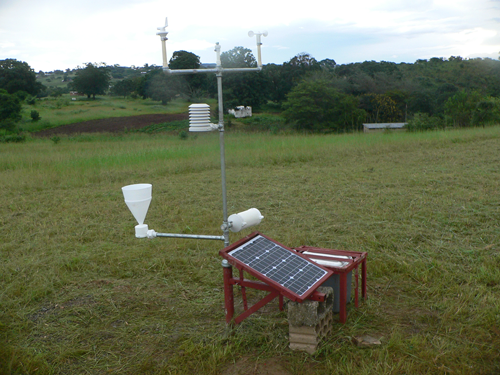 The first five stations, newly installed in Zambia, are beginning to transmit information about temperature, rainfall, winds, and other weather parameters. These measurements and the resulting forecasts can provide weather information for local subsistence farmers deciding when to plant and fertilize crops. They can also alert communities about floods and other potential disasters. "It's a major opportunity to provide weather information that farmers have never had before," said NCAR scientist Paul Kucera, one of the project leaders. "This can literally make the difference when it comes to being able to feed their families." The scientists will next explore the need for low-cost weather stations in other developing countries. The project is funded by the U.S. Agency for International Development's Office of Foreign Disaster Assistance and the U.S. National Weather Service. "The bottom line is that 3D-printing will help to save lives," said Sezin Tokar, a hydrometeorologist with U.S. AID. "Not only can they provide countries with the ability to more accurately monitor for weather-related disasters, the data they produce can also help reduce the economic impact of disasters." Like many developing countries, Zambia does not have detailed forecasts, partly because weather stations are scarce. The density of stations in Africa is eight times lower than recommended by the World Meteorological Organization. Building out a network can be prohibitively expensive, with a single commercial weather station often costing $10,000 to $20,000, plus ongoing funding for maintenance and replacing worn-out parts. To fill this need, UCAR and NCAR scientists have worked for years to come up with a weather station that is cheap and easy to fix, and can be adapted to the needs of the host country. The resulting stations are constructed out of plastic parts that are custom designed and can be run off a 3D printer, along with off-the-shelf sensors and a basic, credit card-sized computer developed for schoolchildren. Total cost: about $300 per station. Best of all, the host country can easily print replacement parts. "If you want a different kind of wind direction gauge or anemometer, or you just need to replace a broken part, you can just print it out yourself," said project co-lead Martin Steinson of UCAR. "Our role is to make this as accessible as possible. This is entirely conceived as an open-source project." Working with the Zambian Meteorological Department and other agencies, Kucera and Steinson installed the first stations earlier this year—three next to radio stations that will broadcast the information to local communities, one by a rural hospital, and one by the headquarters of the meteorological department. The meteorological office will take over the project later this year, with a goal of building out a network of 100 weather stations across Zambia. They will also have the 3D printers, materials, and training to maintain or upgrade the network. The weather station measurements are accessible to local meteorologists and also transmitted over wireless networks in real time to NCAR. After all the weather stations have been installed, scientists will develop a system of one- to three-day regional forecasts for Zambia using the NCAR-based Weather Research and Forecast (WRF) computer model. The forecasts, in addition to helping farmers and other residents, can also alert the country to the threat of impending floods or other weather-related disasters. The system will ultimately be transferred to the Zambian Meteorological Department to run the forecasts. "The objective of the project is to transfer the technology so this will be run by Zambia," Kucera said. Once the technology has been established in Zambia, Kucera and Steinson will turn to other nations that need additional weather stations, such as in Africa or the Caribbean. In addition to improving local forecasts, the additional observations can eventually make a difference for forecasts globally because computer models everywhere will have additional information about the atmosphere. "We're hearing a lot of interest in using this technology in other countries," Kucera said. "It's really quite a return on investment."